Having two back to back long weekends, is that a boon or bane? You’ve just been chasing spirits last week in the incredible northern tip. Had a short week to digest everything and round the corner comes another. Just when I thought that it would be an overkill, I just couldn’t resist the temptation of doing the Tongariro Crossing. 19.4 kms of pure bliss of tramping, steep climbs, slippery slides, volcanic rubble, stunning vistas and a loose ground, its got it all. Tongariro features as one of the best New Zealand day trips for the active (or someone who doesn’t mind a challenge), It also features as one of the 9 great walks of New Zealand. Tongariro also gets honorable mentions and holds itself against the other walks around the world, here is what Walkopedia thinks. For the LOTR fans, this is the crucible of the series. The dramatic settings of the landscape and a one in particular Mt Ngaurohoe or most famously known as Mt Doom, forms the headquarters of Lord Sauron. We huddled into the Mountain Shuttle coach and were off for the first of my NZs Great Walks. The yawns were broken with our bus driver delivering a Maori message about the National Park. A few excerpts that I caught from his speech were. 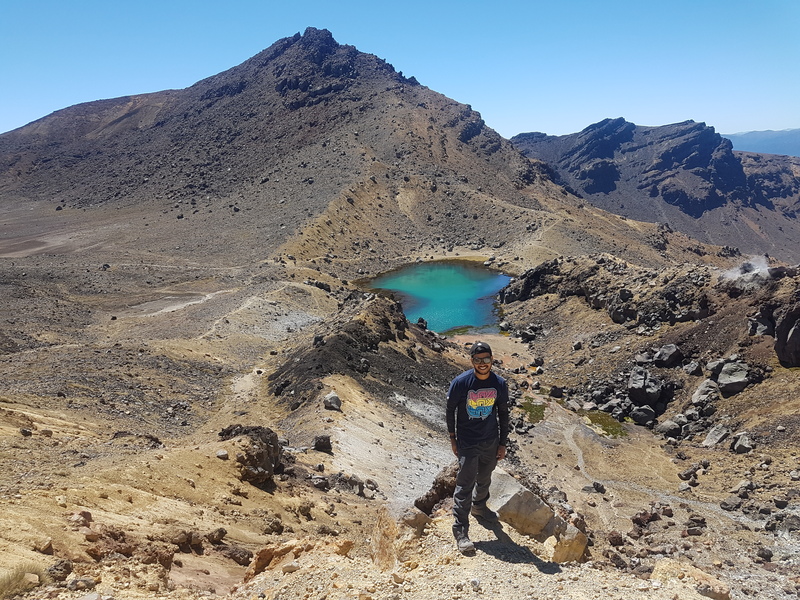 At the end of the rather strenous climb, you reach a cross-road, here you can take a short detour to the top of Mt Tongariro or double that for a 4 hr return journey to the top of Mount Doom. I opted for the summit of Mt Tongariro. Just past the cross-roads is the red crater, this is one of my favourites, imagine a blood red crater, absolutely gorgeous. Slip and slide past the crater and you come to another stunning set of beauties. The gobsmackingly gorgeous emerald lakes. Small pools of sulphur with vibrant hues of blue and green. Its like a painting and like someone just dialed down the temperature setting in lightroom, such radiant colours. Moving on, we reach the massive blue lake (it kinda pales in comparison to the radiant emerald pools). The track now stretches out and an hour or so takes you to Ketetahi Hut. The landscape becomes a bush walk here and you can witness some of the spewing mountains here, sulphur hangs about in the air and you wonder how someone cramped so much beauty in a short stretch of 20kms or so. Another couple of hours and you reach the end of the trail, your tired feet thank you as you trudge into the carpark at the Ketetahi Side. If you’ve left your car at the security carpark, your journey just got longer. We were blessed to have such a beautiful clear day and with nothing more than the occasional breeze. Thanks for reading my post, do check out the Facts about the crossing and what I would recommend carrying. Tongariro is a National Park and is one of the famous active volcanoes, the other being Mt Taranaki. The weather changes rapidly and it is very common for the shuttle services to get cancelled. You can also do it without the shuttle, leave one car at the two carparks at either end. Remember to check the weather, before you leave. You’ve got to have a moderate levels of fitness, it is a strenuos climb and I’ve seen people struggling, you dont want to risk a broken ankle on the loose lava rocks. There are no dustbins throughout the track, so all that comes out of your bagpack goes back in. Good Walking Shoes – Can’t stress this enough, sneakers AREN’T walking boots. Plenty of water – I had a 1.5 litre bottle. I would recommend a 2 ltr bottle. Carry food, some energy bars, a couple of bananas maybe and a sandwich maybe. Most importantly enjoy the walk, take plenty of time (it takes about 7-9 hrs) but its OK to take longer, after all your not going to do this everyday.